Meet at the airport after clearing passport control and drive to Antioch. Before dinner, a “Welcome Briefing” will be presented by your English speaking guide, who will accompany you throughout the entire tour. Antioch was the headquarters of St. Paul’s Missionary Journeys. It was the third largest city of the Roman Empire, rivaled only by Rome and Alexandria. St. Peter, St. Paul, St. Barnabas and St. Timothy all preached in this place where Jesus’ followers were first called Christians. Visit the cave church where St. Peter first celebrated Mass. South of the church, the Iron Gate was one of the actual entrances of Biblical Antioch; strolling through the old part of the city, you cannot help recalling the saints who walked these old streets, for little has changed since that time. After lunch, drive to Seleucia Peria mentioned in the New Testament as the port from which St. Paul and St. Barnabas set sail for Anatolia on their first missionary journey (45-46 AD). Visit the Temple of Zeus for a bird’s eye view of the harbor, and then visit the famous Titus water tunnel. Return to hotel for overnight. Drive to Tarsus; visit the birthplace of St. Paul (10 AD) and drink from the well of the blessed water. Continue on to Cappadocia, land of unique landscapes and the unusual rock formations called “Fairy Chimneys”. Early inhabitants carved the soft volcanic rock to create underground dwellings, that eventually grew to become entire cities where as many as six thousand Christians hid to escape persecution. Elaborate churches-by some counts over a thousand of them-were also carved of the porous rock, and lavishly decorated with frescoes; many of these 9th to 11th century art works still remain. Transfer to hotel for overnight. Visit the Ihlara Valley including painted cave churches, Güzelyurt (Karballa), the birthplace of St.Gregory of Nazianzus and the underground city of Kaymaklı. Return to hotel for overnight. Early departure to Demre, one of the six great cities of the Lycian civilization which was first settled in the 5th century B.C. 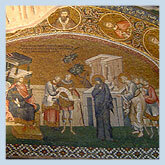 The rock tombs, theater and Church of St.Nicholas commemorate the life and work of this Fourth Century Bishop. Saint Nicholas provided the dowries for three poor girls who would not have been able to marry otherwise, the beginning of our tradition of Christmas giving. Continue to Hierapolis, where we will visit the Martyrium of St.Philip amidst the site’s extensive ruins. Overnight in Pamukkale. Complete the tour of Hierapolis, see the wonderful formation of stalactites in Pamukkale (Cotton Castle), the Roman Bath which later became a church, then visit Laodicea, one of the Seven Churches of the Revelation, continue to Kuşadası for overnight. Today we’ll travel by private boat to the Greek Island of Patmos, location of the cave where John wrote the Book of Revelation, and also spent some time at St. John’s Monastery. Return to Kuşadası for overnight. Depart for Ephesus, cradle of the early Churches. Visit the House of the Virgin Mary, ancient Ephesus, the Archaeological Museum, the Temple of Diana (one of the Seven Wonders of the Ancient World), the grave and Basilica of St. John. Dinner and overnight in Izmir. After Mass at the Church of St. Polycarp, travel to Sardis, the capital city of the ancient kingdom of Lydia, and the church which was built on the foundations of the Temple of Artemis. After traveling to Philadelphia, return to Izmir. Balance of the afternoon is free to explore the city and its ancient bazaar. Overnight in Izmir. Depart to Pergamum to see the Asclepion, the ancient hospital whose approach to medicine was remarkably modern, the Acropolis, the church at the site of ancient Serapium, and the Red Court dedicated to St. John. Continue to Bursa; visit the Green Mosque and the Green Mausoleum. Overnight in Bursa. Drive to Iznik (ancient Nicaea) via the beautiful Iznik lake road. Two ecumenical councils were held here: the First Ecumenical Council of 325 and the Seventh Ecumenical Council of 787. 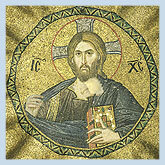 Visit the ruins of the St. Sophia Church where the Seventh Ecumenical Council was held. In the afternoon, drive to Istanbul, the only city in the world spanning two continents; transfer to hotel. Evening at leisure. A full day of sight-seeing in Istanbul. Visit the Blue Mosque with its beautiful blue tiles, the Roman Hippodrome, and Topkapi Museum, the Imperial Residential Palace of the Ottoman sultans between the 16th and 19th centuries and the oldest and largest of the remaining palaces in the world. Its displays include priceless world-class collections of jewelry, porcelain and costumes of the sultans. In the afternoon, take a boat trip through the Bosphorus Strait, viewing the mosques, palaces, old traditional wooden villas and the beauty of the Asian and European shorelines on each side. Evening at leisure. Afterward, we`ll have the opportunity to go shopping at the Grand Bazaar. This evening, we gather for a farewell dinner. After an early breakfast at the hotel, transfer to the Istanbul Ataturk Airport for your flight home.